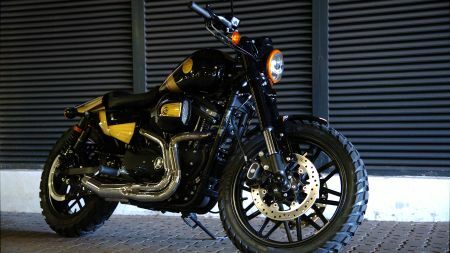 Home › Latest News › Battle of the Kings 3: H-D® Durban's Entry! Our designer incorporated Harley®'s rich racing heritage with the subtle chequered flag in the detail of the paintwork and also highlighted some of the copper accents with the drag style handlebar and headlamp trim ring. This bike was fitted with fully adjustable shocks for the rider to experience the ultimate in handling and ride quality. Ultimately we wanted this bike to ride/handle as amazing as it looks. The wheels set this off with a real “gnarly” feel to add to the overall attitude of this Sportster®. Khan has been customizing Harley®’s for 5 years and pays close attention to the lines/detail of his builds. He previously won the best H-D® Freestyle Custom at Africa Bike Week in 2014.